Use Switcher Studio to broadcast to your ChurchStreaming.TV account: http://churchstreaming.tv/. Link your ChurchStreaming.TV account with Switcher Studio by entering your account details into the /en/. Once you are logged in to ChurchStreaming.TV, click on Setup Computer/Device from the Administrator Dashboard on the right-hand side of the page. In the Setup Computer / Device section, choose Switcher Studio from the Install And Configure Your Encoder drop down menu. 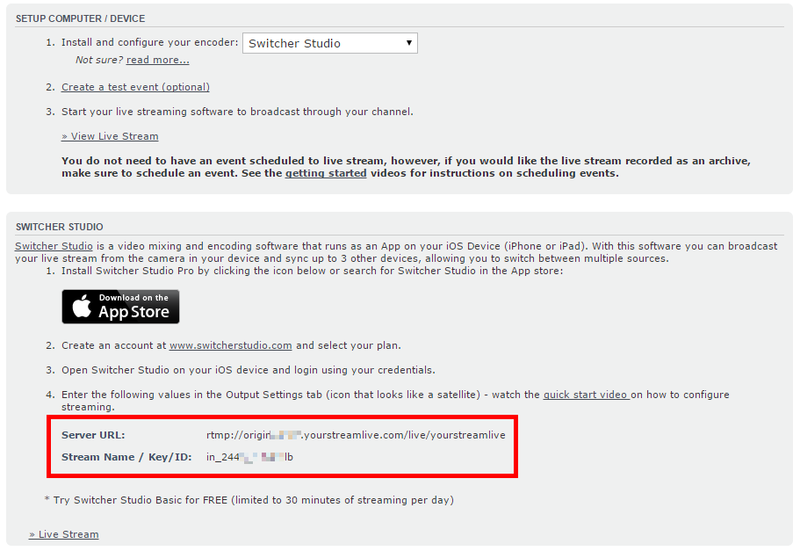 In the section labeled Switcher Studio, please note the Server URL and Stream Name / Key/ID. There are the two values you will need to enter into Switcher Studio to start streaming to ChurchStreaming.TV. You can create a new channel in one of two ways: Using the Online Dashboard or from Within The App. Log in to your Switcher Studio dashboard and link your ChurchStreaming.TV account from the Link Streaming Service menu. Once your channel has been created, click on the Speed Test button inside the newly created ChurchStreaming.TV channel setting to automatically detect the best resolution and bit-rate to stream at for your internet connection. Click Save to save your settings. Now, go back to the Switcher Studio app, go to the Outputs Tab (looks like a satellite dish), tap on Streaming Video Platform, and then tap on the "+" button next to it. Swipe down on the RTMP Channels panel to sync your channels with the Dashboard. Select ChurchStreaming.TV as your RTMP Channel. Launch Switcher on your iPad or iPhone. Open the “Outputs” tab (second tab on the bottom right panel). Select “Streaming Video Platform”. If it's already selected, tap the "i" button on the right. Add a new channel by touching the "+" button. In the “Server URL” field, enter the text you saw on ChurchStreaming.TV, under “Server URL”. In the “STREAM” field, enter the text you saw on ChurchStreaming.TV, under “Stream Name / Key/ID”. Tap “ok” to close the RTMP parameters window. You are now ready to stream. Just tap “Rec + Broadcast” to start streaming. You can test your stream by clicking on the on the "Live Stream" link on your ChurchStreaming.TV dashboard. **Please note that in order to archive your stream on ChurchStreaming.TV's servers, you will need to create an event on the ChurchStreaming.TV dashboard.